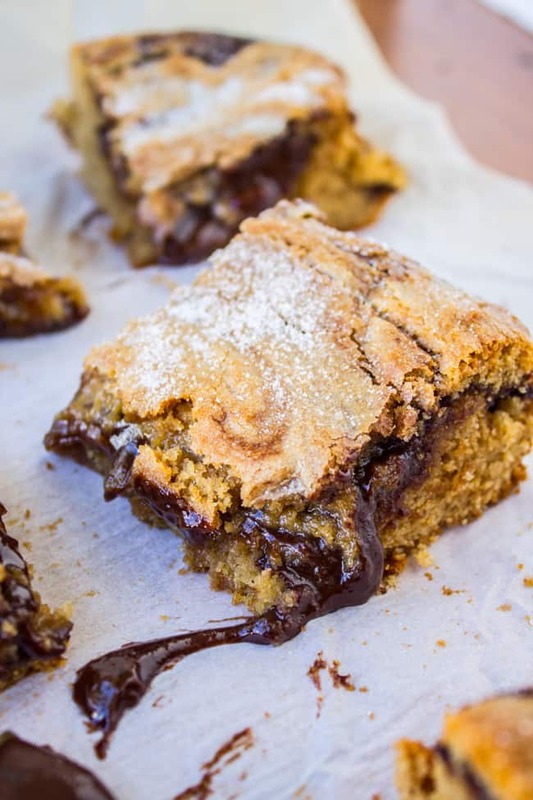 Rich and gooey peanut butter bars…full of chocolate ganache. Ganache is basically chocolate and cream melted together. And now it’s inside peanut butter blondies. Grab a tall glass of milk my friends. Have you guys ever taken the love language test? I just did it last night because that was the assignment for my Article Club. (Article Club is just like a book club–we ladies get together every month and eat food and chat and MAYBE talk about the book, or in our case, article. NY Times articles, podcasts, TED Talks, whatevs.) This month we all took the love language test and compared notes. My friend Lara got 7 points for Words of Affirmation, 7 points for Acts of Service, 7 points for Receiving Gifts, 7 points for Quality Time, and 7 points for Physical Touch. I can’t decide if she is the easiest person to please or the hardest. What do you think your love language is? Is it obvious? I categorize myself into a 6th love language category: Chocolate-Peanut Butter love. Seriously, you give me this combo in any format and I will love you forever. 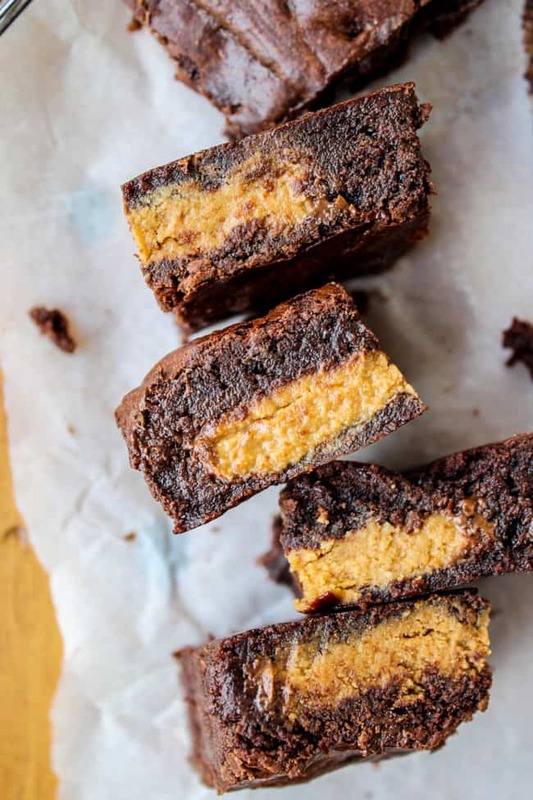 Carla of Chocolate Moosey and Miriam of Overtime Cook are hosting the 2nd annual Chocolate-Peanut Butter Day, because why SHOULDN’T there be a day dedicated to this match made in heaven. I’m getting together with a bunch of other bloggers who have come up with dozens of ways to consume this magnificent duo. 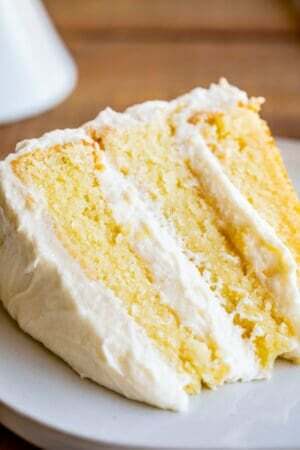 Check out the links at the bottom of the post to see everyone else’s recipes! 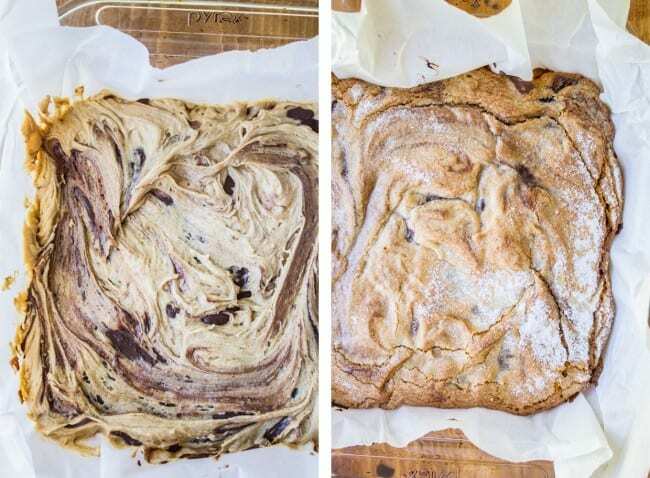 Now, about these PB blondies…guys. They are amazing. I am a huge sucker for bars because they are so soft in the middle, but when you stuff bars with ganache it just brings it to a whole new level. Don’t skip the sugar on top! It gives it that perfect crunch to offset all the ridiculous gooeyness. Make the ganache first. In a bowl or tupperware, add the 1/2 cup cream. Microwave on high for about 1 to 1.5 minutes, or until the edges have started to bubble. Immediately add the chocolate chips and let it sit for about 1 minute. Use a whisk to slowly combine the cream and chocolate. It should be smooth when you are done. Add a bit of salt and 1 tablespoon butter. Cover and put in the freezer for about an hour, or until it is cold enough to be hard to the touch. Preheat your oven to 350 degrees F. Grease a 9x9 or 8x8 inch square pan, or line with foil (and grease) or parchment paper. In a bowl, stir together melted butter, brown sugar and white sugar. Stir in the peanut butter, vanilla, eggs, and milk. Combine well. 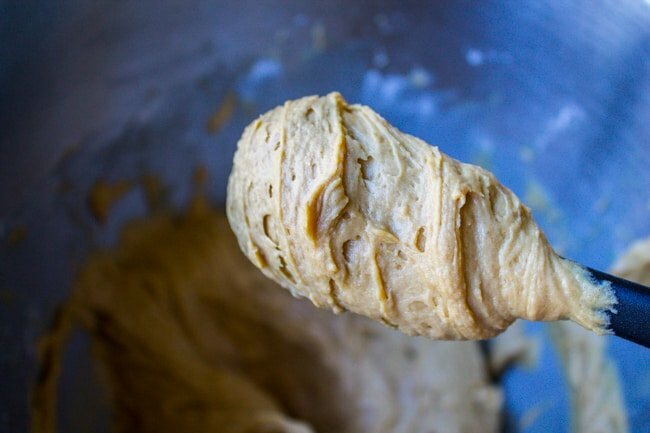 In a separate bowl, whisk together flour, baking powder, and salt. Add to the wet ingredients and mix until just combined. Spread the batter into the prepared pan. Take the ganache out of the freezer, and use a spoon to scoop it out and press into the batter. My scoops were probably 1-3 teaspoons each. It gets pretty melty pretty fast. By the end of adding mine it had pretty much returned to room temperature, and had swirled quite a bit. That's ok! Cover up the ganache with the batter as best you can. Sprinkle 1-2 tablespoons white sugar over the top of the batter. Bake at 350 for 28-29 minutes, or until the center has set and the top is golden. Let cool at least a few minutes before cutting. Hi! I made these last night, and the boyfriend and I were licking the bowl. The genache is stupid good. BUT they baked up really cakey and not dense like a blondie. What might I have done wrong? I’d like to try again. Thanks! oh my goodness, oh my goodness. These look soo divine! What is better than chocolate and peanut butter. Like get in my mouth now! Very different! Kind of crunchy and gooey! Yum! Wow…these truly look amazing. Truth is I love a bit of goopy and how could I help but to LOVE these! I love receiving gifts but I always feel kinda bad about it too. I totally ask the “how much did this cost” question, followed with “I don’t deserve it!” We both need to stop the insanity and just reap the benefits! 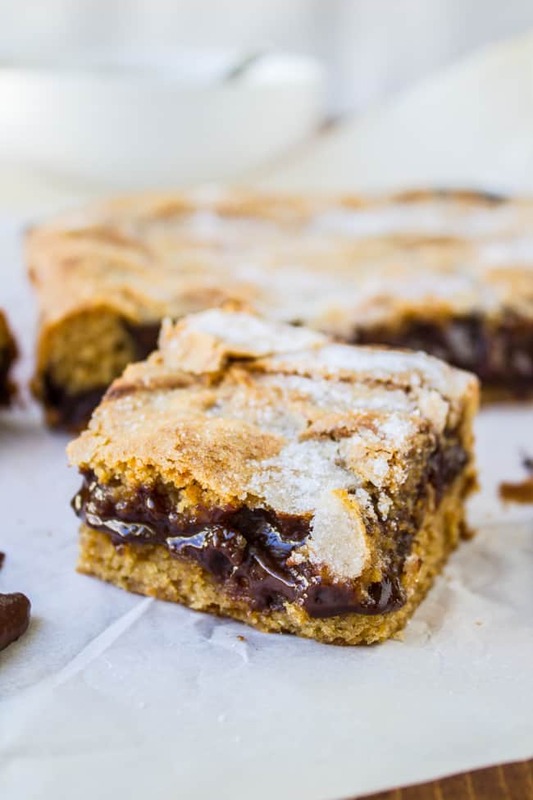 For example, when I see these photos of your ganache-filled PB bars, all I wanna say is “Gimme, gimme, gimme!! !’ These are amazing, Karen! 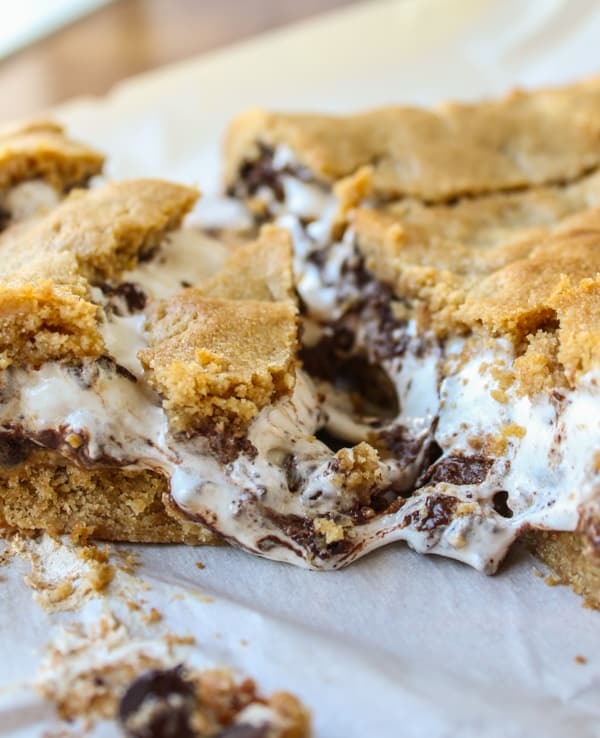 These are inspiring, stunning, and have a huge “get in my mouth” factor. Awesome! I’ve taken that love language test before and I don’t really remember what I got. But I would definitely be number 6!! PB+Chocolate = I’m going to marry it! The Article Club sounds like so much fun! Wish there was something like that around where I am! And these bars–what a fantastic day to celebrate Choc/PB Day! Pinned! Stop it. Right now! Ganache inside peanut butter bars?! Be still my heart! Pinned, friend! I need these ASAP! I’m so a ZERO on gifts too. Even flowers? I always hate how much they cost. I’m words of affirmation mostly. Tell me how great I am! Only from my husband. From other people it makes me feel weird. I’ve totally taken that test! 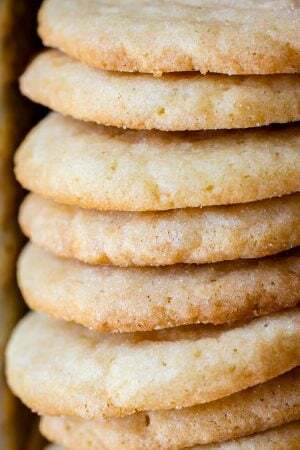 And have since declared that cookies are love language. After seeing these bars, I’m pretty sure I’m going to change that to cookies and bars are my love language. These look SO good. 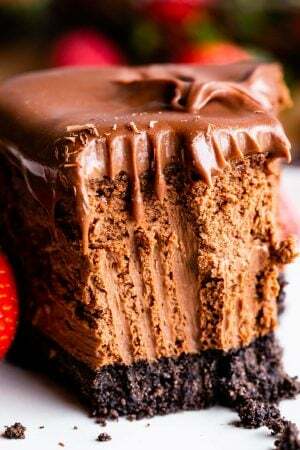 Oh my gosh- that chocolate ganache in the middle looks amazing!! I’m totally with you on that 6th love language! I’m pretty sure thats mine! Umm..ganache STUFFED?? Yes please. Right now. I’ve never taken the love langue test. I’m scared what it would say. 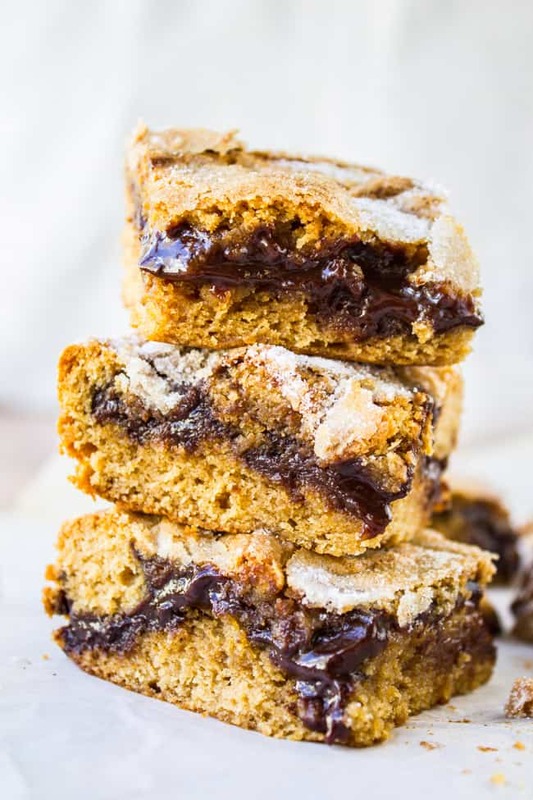 But I do know that these blondies look delicious and that pb and chocolate..man you had me at blondies, but all this gooey goodness. Yum! So what you’re saying is I should return the César Chávez Day gift I got you? Chocolate + Peanut butter? These are like Reeses but so much better because they’re melty and chewy. I want a whole pan. I’ll consider it an act of service. Choc peanut butter and choc mint are my two favorite combos. These look perfect! 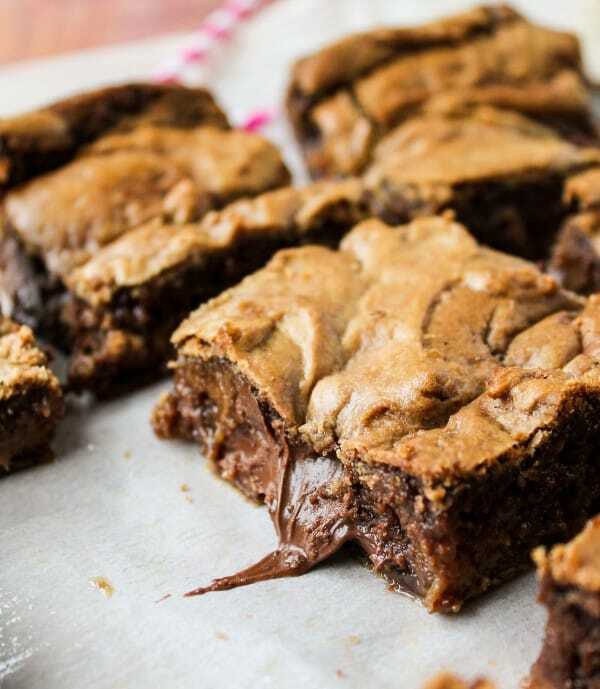 Nothing better than warm ooey gooey chocolate! 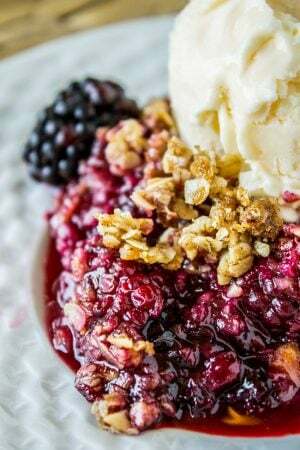 I’m already dreaming about these with a big scoop of ice cream! Oh, man, look at that gooey ganache! These look delicious! So much chocolate peanut butter love going on here. SO much oozing chocolate! My love language is actually receiving gifts — does that make me a horrible person? Lol. Mmm, this looks too good! That center is making me melt :) So delish and what a wonderful spin on the classic chocolate and peanut butter combo. Pinning! Oh, my gosh, that gooey ganache center has me swooning! What terrific bars!!! I’m in serious love with that ooey gooey layer of ganache. That’s MY love language! 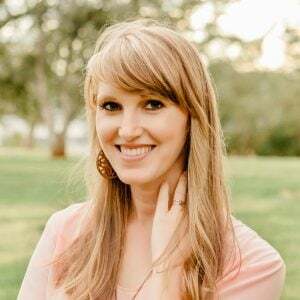 My Pastor made us take that love language test before we got married. You know what mine was? 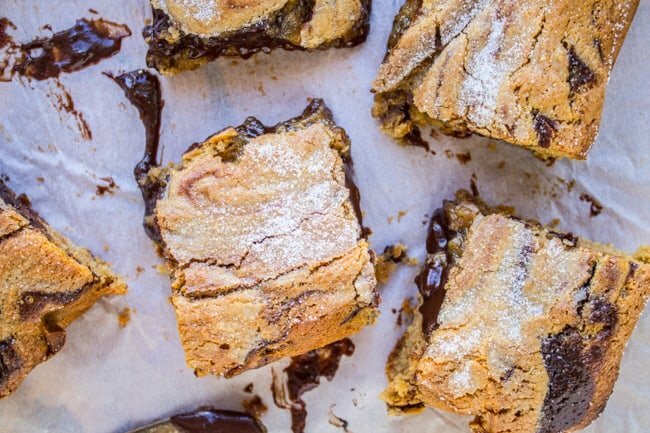 Ganache Stuffed Peanut Butter Bars. HOW DID IT KNOW? ;) Pinned! I think I’ll be dreaming about that chocolate oozing out of those bars for days. Wow how incredibly rich and wonderful they look.